It’s happening: Your kiddo is leaving the land of preschool and heading into the big new world of elementary school. How will he or she survive it without being overwhelmed? How will you survive it as a parent? There is a big growth period during the elementary years. This is an ideal time to let your child become more independent. This can sometimes be tougher on the parent than the child; however, in the long run, it is better to let your child start to make some decisions on her own. Let your child make mistakes. Dealing with consequences helps children see that things will be okay and that little things are not the end of the world. If your child forgets to return a homework paper to school, don’t bring it to them. Your child will learn to bring it next time. If your child wants to choose what they wear, let them be themselves (within reason). The earlier you embrace the fact that your child can make decisions and turn out just fine, the earlier your child will have confidence to make these decisions on her own. That being said, a little bit can go a long way. Maybe you don’t want to plan every party, but you have time to volunteer at the Halloween party. Perfect. Perhaps you have a morning off from work to help out at the book fair. Great. And if you can’t manage to volunteer, you can offer to send in some cups or plates to help out. It’s natural for children (and parents) to feel a little nervous throughout elementary school. There are big changes such as all-day schooling, riding the bus, eating lunch at school, and getting used to a new building. To help calm some of the nervous energy, visit the school and the teacher each year before the first day of school. Talk about the positive things to come each year like being able to buy lunch and have recess. Find a buddy in class or on the bus to invite to a play date so your child can be familiar with at least one other classmate. As a parent, we need to make sure we don’t transfer our nervous energy to our kids. When you say good-bye, give a hug and a wave, and be strong as they board the bus. Your confidence will inspire confidence in your little one. You can take a deep breath and know that you are helping your child gain confidence in himself. Homework is an added stress to many families, but it doesn’t have to be. 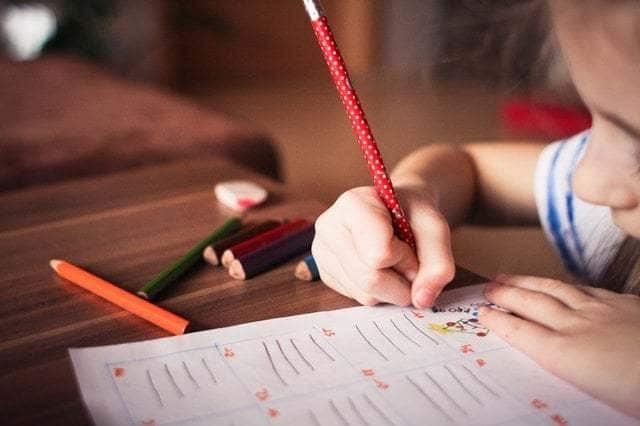 Make a plan with your child for how you are going to get homework done each night. Choose the time and place for homework. Clear the area of distractions, and ask for help if needed. Teachers are willing to help you if your child is struggling with homework. You can also go online to find practice sites and video tutorials. Another suggestion is to work with your child to develop a long-term plan for bigger assignments. Do a little bit each day rather than wait for the last minute. This will make the entire homework situation much calmer for everyone. Elementary school can be a great time for your child to explore all kinds of sports and activities. Beware of overscheduling your child, but allow her to try things if she expresses an interest. There are various sports teams that range from recreational to competitive. You can choose what fits your child best. If athletic activities aren’t her thing, choose a music class, a Lego club, or a scout group. There are a lot of things from which to choose. Keep the activities fun. This should be a time to relax and have fun with friends. Elementary school might be scary at first for kids (and parents), but it doesn’t have to be. Embrace the new discoveries and challenges as opportunities for your child to grow and become independent. These are years filled with fun milestones and events that will create memories for a lifetime. They will go by quickly, so remember to breathe it in, remain calm, and enjoy the journey.